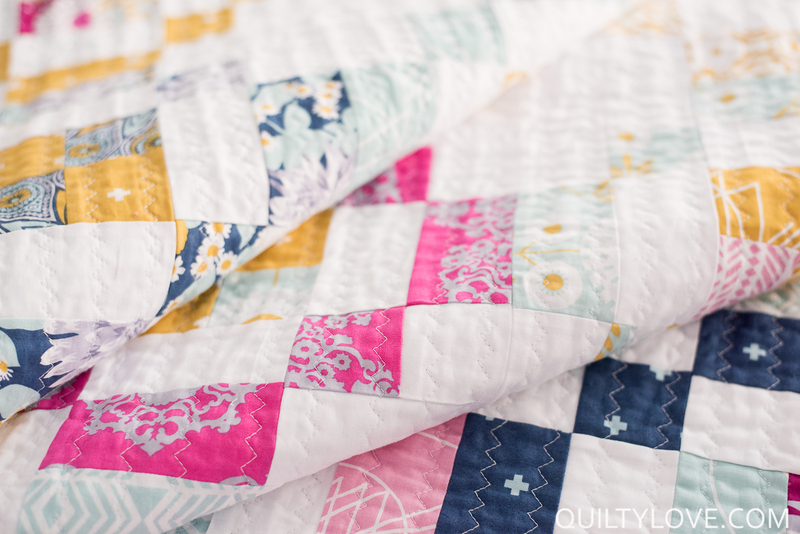 Get your jelly rolls ready because I have a fun new jelly roll friendly quilt pattern to share today. 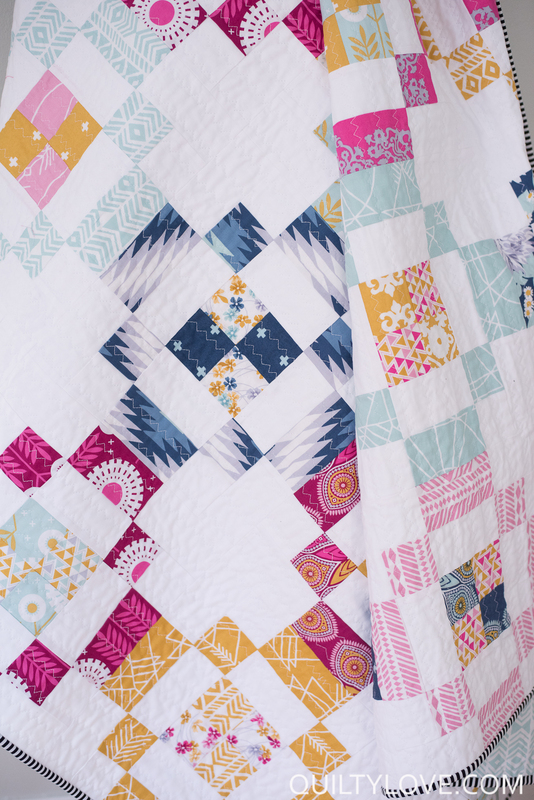 Jelly rolls are one of my favorite precuts because it’s the easiest way to get the entire fabric line all at once. They are fun to collect because they look so cute sitting on a shelf. That makes them easy to hoard ;) But not today! 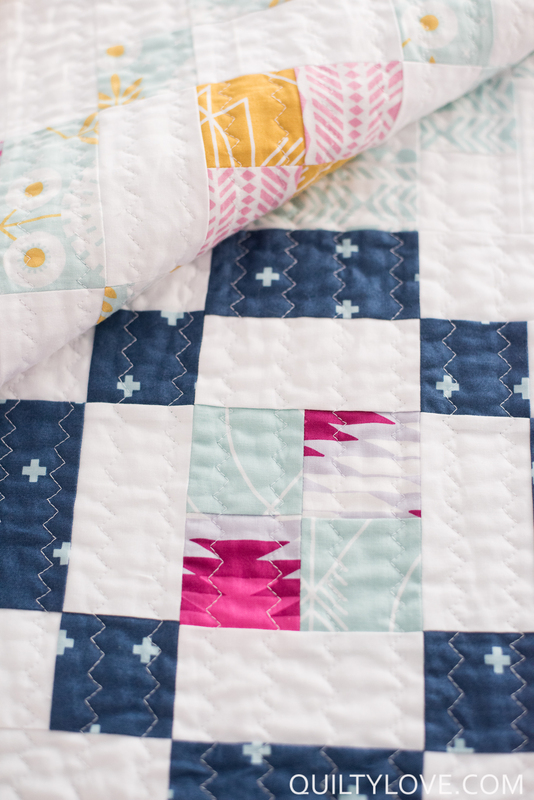 Choose your favorite one and whip up this easy and fun quilt pattern. 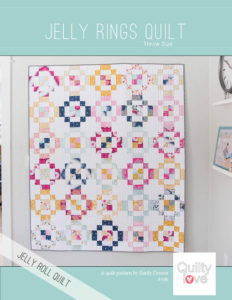 Get your copy in the Quilty Love Pattern shop! Jelly Roll is actually a Moda Fabrics term. It’s a collection of 2.5in x the width of the fabric strips. So usually 2.5in x 42in. 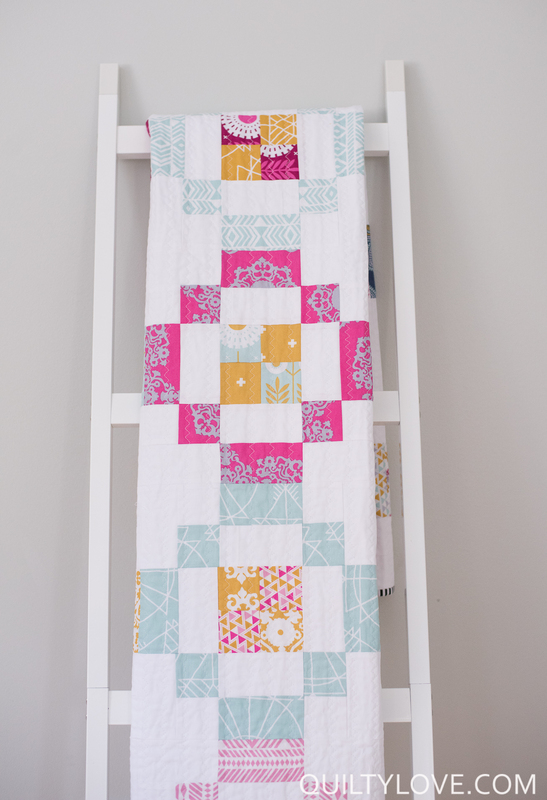 A jelly roll usually has about 40 strips from the same fabric line in the roll. Other brands call them by different names such as Design Rolls, Roll ups or just 2.5in strips. 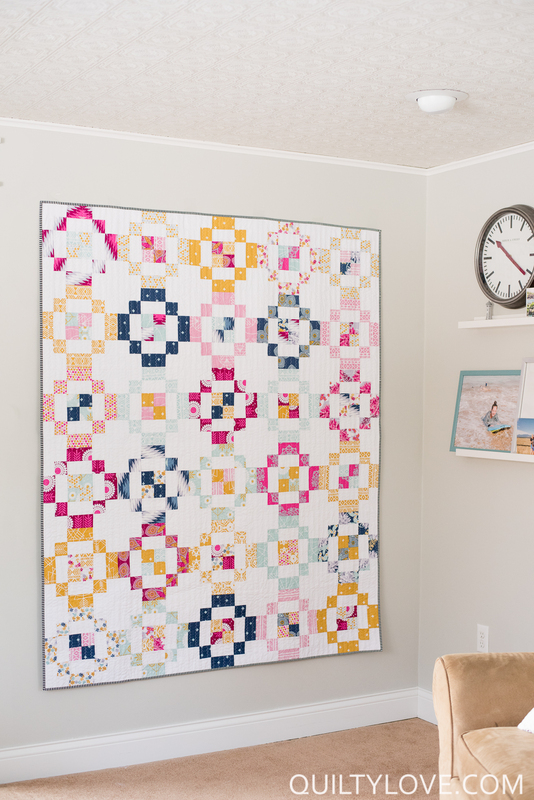 The Jelly Rings quilt uses 1 jelly roll or x30 2.5in x WOF strips from your fabric collection. Jelly Rings is just that, rings around a simple 4 patch. 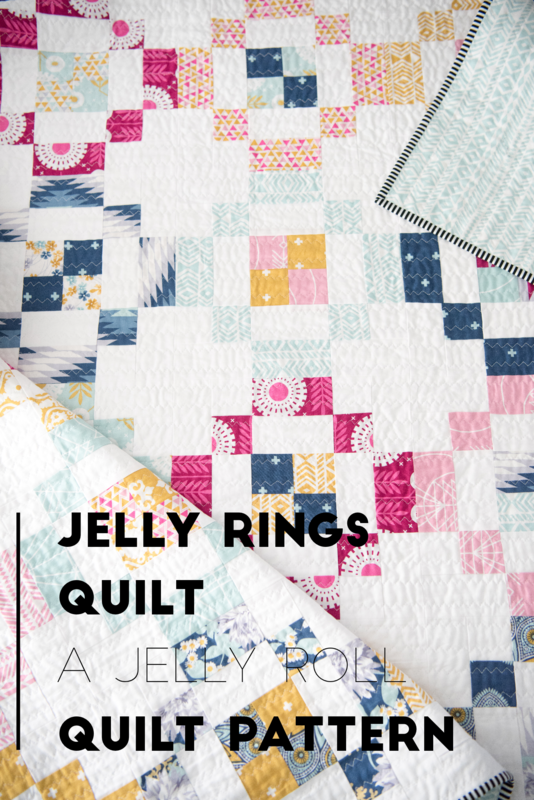 Jelly Rings allows the fabrics to shine while still subtly mixing them all together. 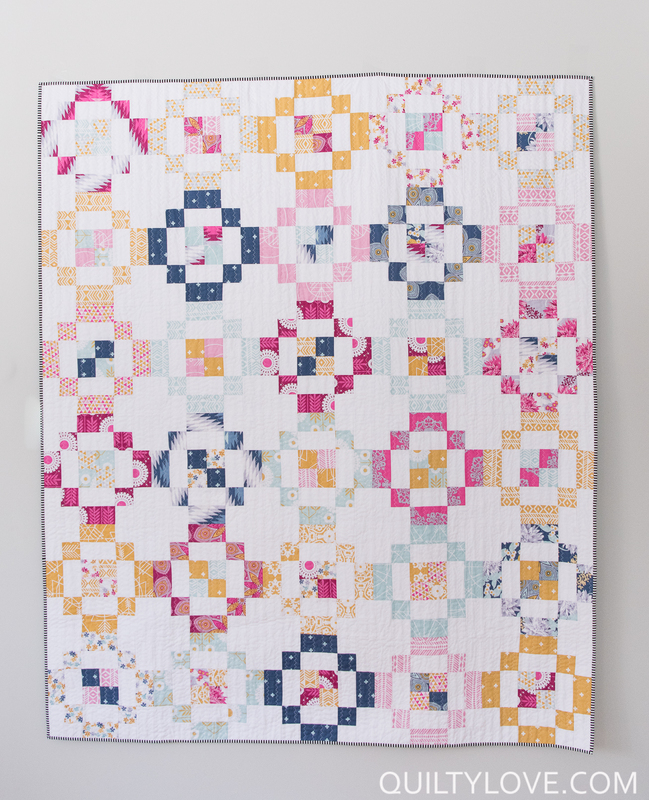 I love the secondary plus sign this quilt makes. It’s always fun when a secondary pattern shines through. I went with a Joel Dewberry Jelly roll for my version. 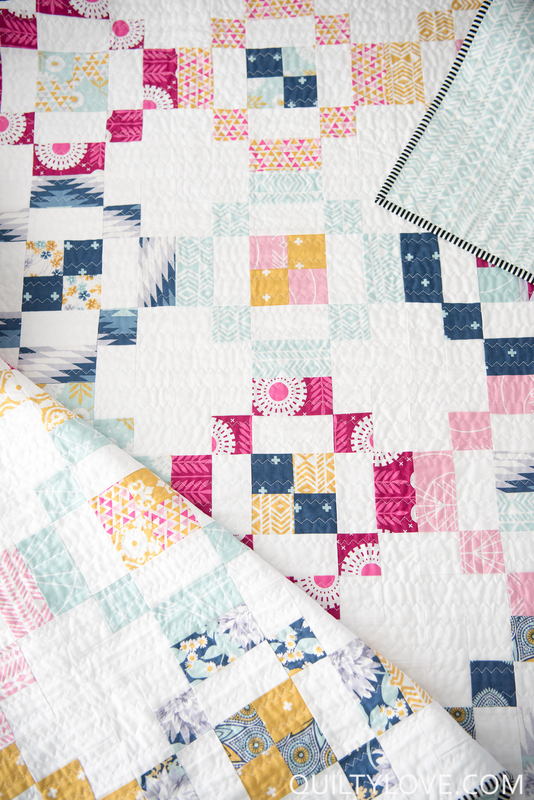 This is the Wander fabric line. The bright jewel tone colors pop so beautifully against my favorite stark white background. 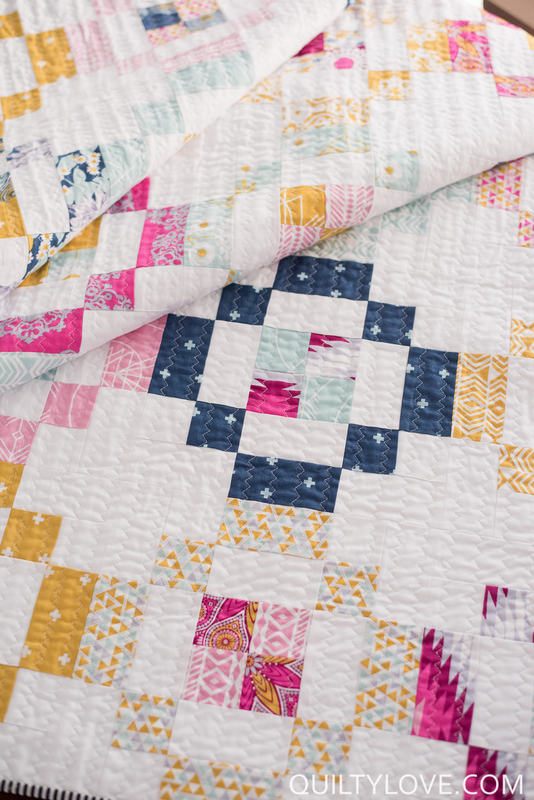 This quilt is a great one for beginners. Jelly Roll strips don’t always measure an exact 2.5in wide so taking the time to trim them is helpful in lining seams up better. I regretted not trimming my strips so not all points are perfect but the pattern is forgiving in that they are hardly noticeable. 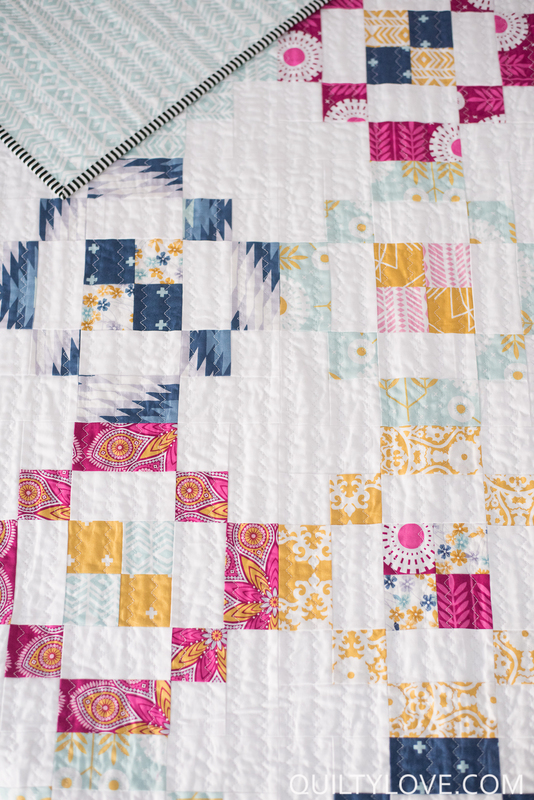 There are a few strip piecing shortcuts allowing this one to go together in no time. 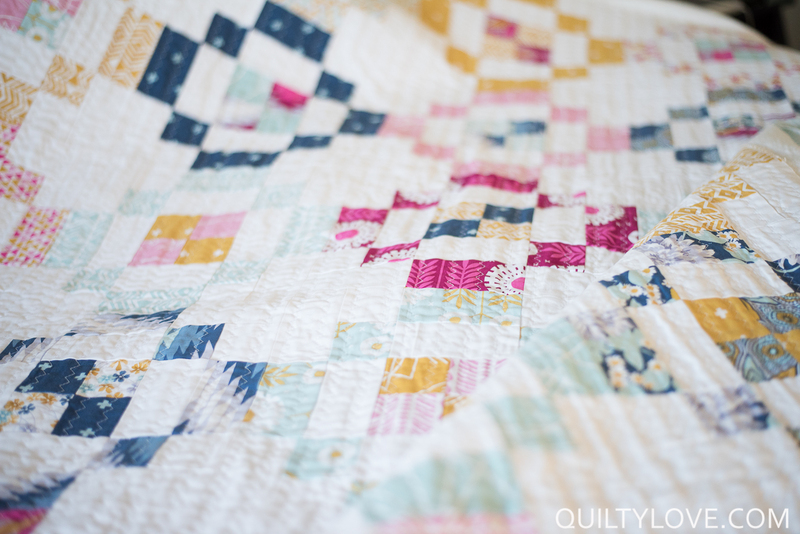 I quilted my Jelly Rings quilt with my favorite zig zag stitch on my Janome. I spaced the stitched lines 1 inch apart. This stitch gives such a pretty overall effect and crinkles up so nicely. Find the zig zag walking foot quilting tutorial here. 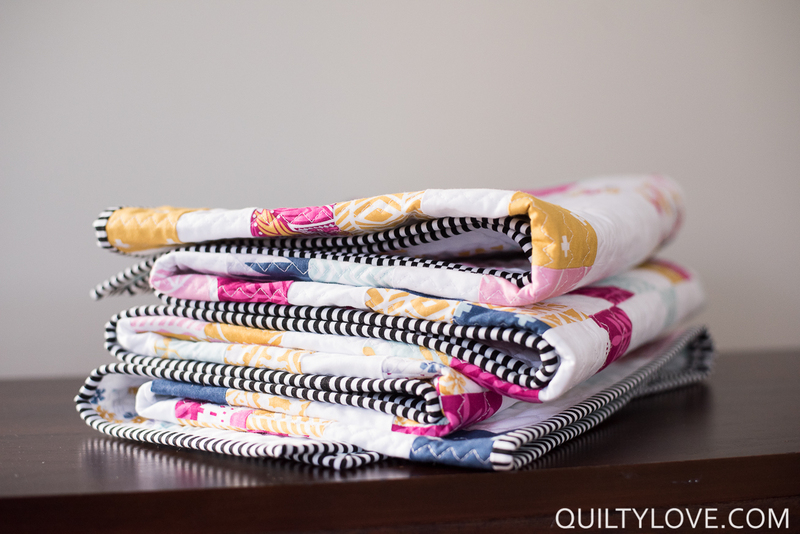 I backed the Jelly Rings Quilt with a pretty aqua fabric from the Wander line and finished it off with a Timeless Treasures black and white striped binding. 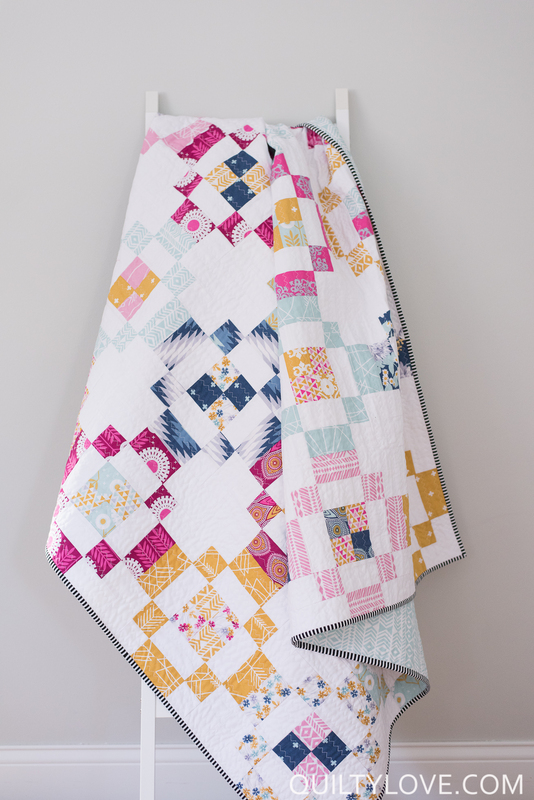 This quilt is a throw size quilt and the directions include an option with or without sashing. You can get your copy in my pattern shop as an instant PDF download or paper copy. 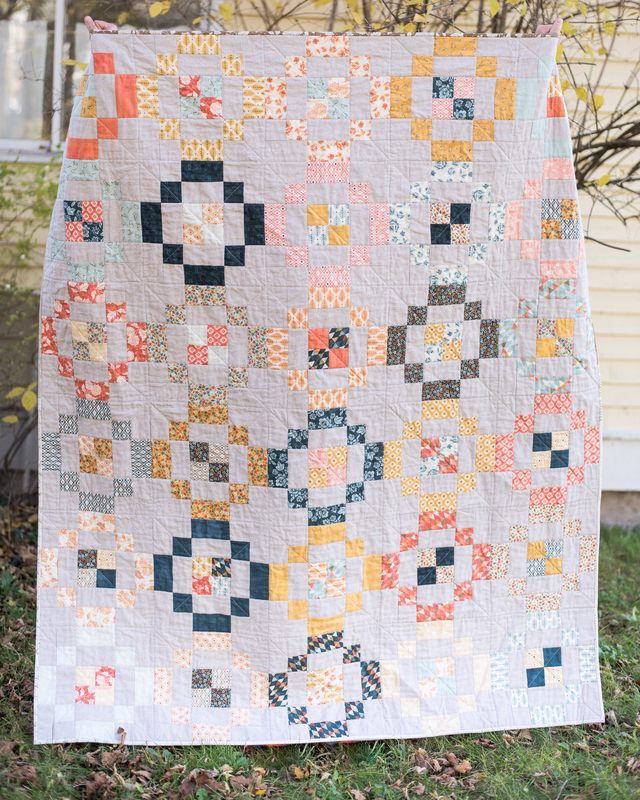 I also made a fall version of the Jelly Rings Quilt and will blog it soon. Love this pattern! It is my third quilt, but first one outside of HSTs, so I’m excited to step out of my comfort zone. I’m a newbie! I started cutting my backround fabric last night and realized that the fabric requirements do not leave room for much waste at all. Which is a good thing!! But it was too late for me…I had trimmed my strips on the fold (to make it easier/faster to measure) which meant I only ended up with 60 rectangles instead of 90. So back to the fabric store I will have to go. Just commenting in case any other beginners out there are like me and don’t think things totally through before diving in!! Thanks for the feedback Julie! I hesitate to include waste or no waste methods. You are not the first to cut on the fold first! Definitely something to consider as I go forward with pattern designs :) Glad you are tackling this one!